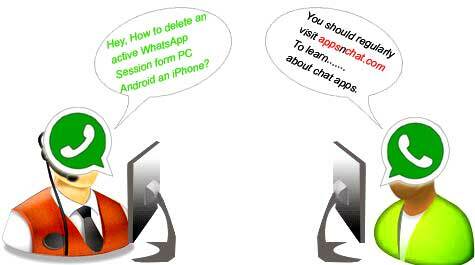 For the safety of the conversation on WhatsApp web, you need to log out the active WhatsApp session. Nowadays WhatsApp is available for the Windows device. It is the excellent experience to enjoy WhatsApp on the big screen of your PC using your favorite keyboard. But you should think for the safety. You should know that if you keep logged your WhatsApp account, you can face the safety problem such as anybody can spy you or use your account on your Android and iOS devices. So, for your security, always log out your active WhatsApp. WhatsApp web is impressive that allows you to enjoy it on your computer. Besides, on your Android and iOS device, you should log out your account because anybody can misuse it. Now I am here to provide you the best way to remove the WhatsApp session from your devices. At first, you should open the WhatsApp on your computer by clicking the icon. Now go to the WhatsApp menu on your computer, and it is at the top side of the screen. Then click on the logout option to log out the web version. It is straightforward. Now you have to do these steps to log in again. You have to click on the WhatsApp icon to open it. Your WhatsApp will show you a QR code. Then you have to scan this code from your Smartphone to use it again. If you use this WhatsApp on the public computers, you should uncheck the keep me sign in option. For remote logout of WhatsApp on your computer, you can use your Android device. Let’s follow the steps. Open the WhatsApp on your Android mobile phone. Now tap the menu on the top right side that seems three dots on the screen. Then drop down the menu and open the WhatsApp web. Then tap on log out from all PCs. You will find a pop-up and then tap it to log out. You also use your iPhone to log out your WhatsApp web remotely. Let’s see it. Open the WhatsApp on your iPhone. Then go to the Settings option from the right corner. On the settings option, you will see the WhatsApp web. Next, you will get the ‘Log out of all computers’ option. Then the logout pop up appears, and you should tap on it. As WhatsApp conversation is very important, you should keep it secure. So, if you use the WhatsApp on a public computer, you should properly log out the WhatsApp session. If you remember that you forget to log out WhatsApp on your PC, you can use the processes to remote log out with your phone.